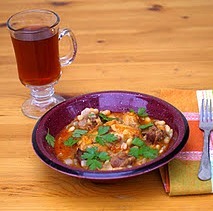 There is not many things that I love better than a warm, comforting, stick to your ribs Cassoulet. The thing is, sometimes you need to spend all day to make it. If you want it to taste really good anyway. This recipe is not that kind of recipe. What I mean is that it tastes awesome and it’s not a all day thing. It takes about an hour and a half from start to finish. So it frees you up to do other things. So, help with homework, or get some exercise by walking the dog, while it cooks. Preheat oven to 350 degrees. Rinse and dry the chicken. Season with salt and pepper. In a large dutch oven over medium low heat, add the chorizo sausage and slowly render the fat. Remove the sausage to a plate and raise the heat to medium high and add the chicken, skin side down. Brown the chicken on both sides and then remove to a plate. Add the onion and garlic saute until soft about 5 minutes. Deglaze the pan with white wine and reduce by half. Stir in the beans. Nestle the chicken thighs and sausage in the pot. Add the vegetable stock cover and bake in the oven 30 minutes. Stir Casserole return to the oven another 20 minutes. Serve the cassoulet with french bread slices. 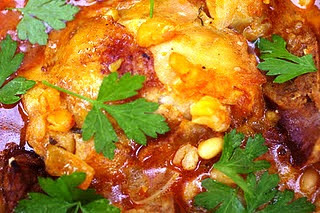 What a homey and saucy cassoulet! Would be lovely with some rice or even flatbread! What a beautiful dish! It looks so delicious and comforting! Wow, this looks so comforting and delicious. If it’s quick too it must be perfect! I’ll definitely be making this soon. 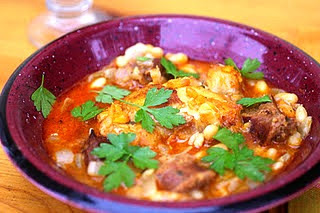 Cassoulet combinations are the best – quick, slow, thousands of ingredients, four ingredients… they just comfort. Yes, I could take a walk while this cooks. Or just – play on the computer! I love this dish and your variation. 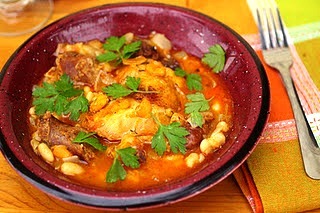 There is nothing like a great cassoulet for a winters night…yum! Yours looks perfect! Nice post! 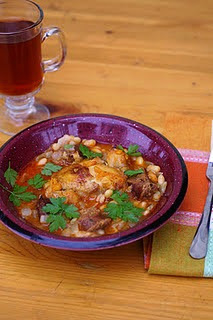 I love cassoulet, such a perfect cozy Sunday meal. 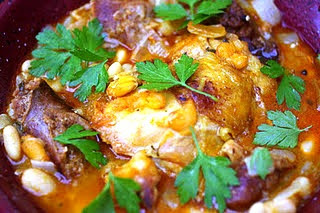 I’ve made cassoulet with duck but not chicken, a much less expensive version for sure. I’ll have to give it a try! Perfect for such a cold weather! Veronica (Vonnie) is a widowed Catholic mom and a Coastal Virginia based food writer, a not so perfect Weight Watcher follower and animal wrangler, with a constant yearning for freshly baked bread, Krispy Kreme donuts, fried chicken and setting off the fire alarm in the pursuit of the perfect recipe. ©2019 My Catholic Kitchen. Design by Purr.